A internal combustion engine is a type of thermal motor in which the a fuel is combusted in pistons, turbine blade or through a propulsive nozzle. Most popularly used internal combustion engines are "gasoline" or "Otto-type" engines (engines using the Otto-cycle. Otto-type or spark-ignition engines use a spark (provided through a spark plug, powered by a battery or magneto) to deflagrate the fuel. Batteries require electronics (ie printed circuit board), whereas magneto's use a magnet to immediatelly convert rotational energy to electricity. The latter are thus sturdier and preferred in most cases. Advanced systems using batteries can be more fuel-efficient though. "Diesel engines" are a entirely different type of engine. Diesel engines use the Diesel cycle. . As clear in the cycle, the inlet only introduces pure air, and not a air/fuel mix. A additional, separate, fuel inlet is also present, the outlet is the same as with Otto-engines. For their ignition, they rely on compression-ignition. Note that contrary to popular belief, the 2 types are not restricted to run on either petrol (gasoline) or diesel. The diesel engine for example was initially designed to run many types of fuels (including peanut oil, which is a type of biofuel). It is still capable of running on this biofuel (as well as many other biofuels) although some tweaking is generally necessary to circumvent some current limitations (since the initial Diesel-engine, Diesel engines produced today typically use direct or unit-direct injection rather than indirect injection). Gasoline engines are typically a lot more restrictive in regards to the fuels they can run on (principally only ethanol, some gaseous biofuels (wood gas, oxyhydrogen, hydrogen, nitrous oxide, ...). Note that a differentiation needs to be made between Diesel engines. 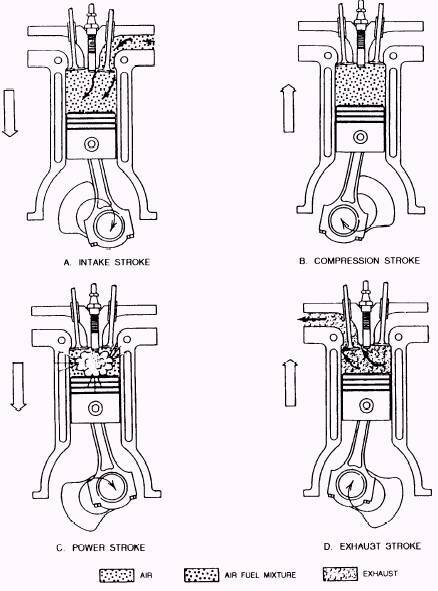 In general, we can distinguish 2 main types: the 4-stroke Diesel engine and the 2-stroke Diesel engine. Both need to have indirect injection as direct/unit-direct injection does not allow the use of low-grade fuels (ie low-quality plant oils, ...) The 4-stroke Diesel engine equipped with indirect injection only attains a efficiency of 35%, whereas the 2-stroke Diesel engine (of the uniflow crosshead type) can attain 50% efficiency, and run on any type of liquid fuel. Note that the 2-stroke Diesel engine is only useful for stationary applications, as they are very heavy. They have been used in ships, as in these vehicles, the extra weight of the engine doesn't matter as much as in ground vehicles, as vehicles on water already experience a weight reduction. Regardless, they are nonetheless best not used for this as weight still plays a role (although a lesser one). Page was last modified 05:28, 17 July 2013. Based on work by Joe Turner, Chris Waterguy, Appropedia anonymous users 91.182.227.66, 91.182.19.166 and 91.182.15.238 and others.